Every year about this time, we start to get more and more visuals about the upcoming summer movie season. I love summer movie season. I don’t have to think or worry about Oscar consideration. I can just sit back, eat my popcorn, laugh and watch stuff blow up. And, really, isn’t that what you want in a summer movie? After reviewing my list for last summer, I can only hope this year’s batch is better (I’m looking at you Jonah Hex). There are lots of spandex types and some good old fashioned raunchy comedies. Its gonna be a great summer. Let’s take a look at my highlights, in chronological order. THOR – The first of the four(!) 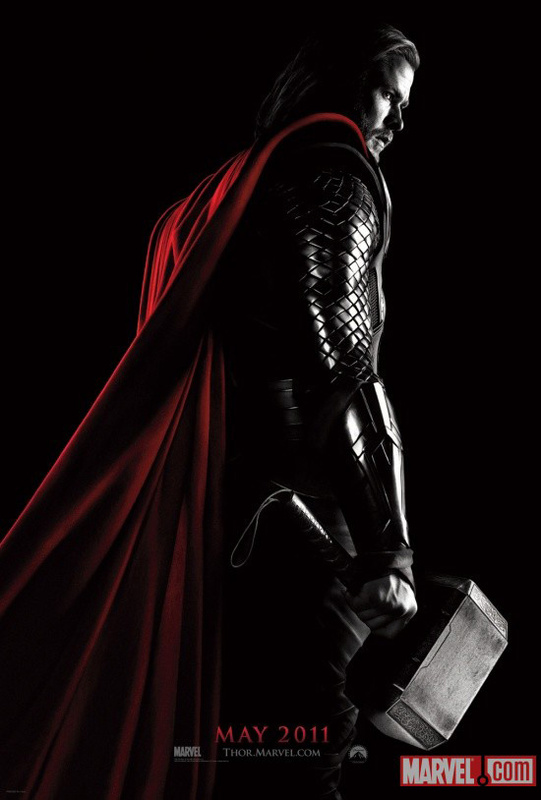 superhero movies hitting the screen this summer, Thor hits with a mystic Uru hammer. Yeah, I’m a Thor geek. Yeah, I’ve been waiting for this one since I was about nine years old. Yeah, I’m gonna see it on opening weekend. It has the Destroyer in it! For the love of Odin, what could be better? PIRATES OF THE CARIBBEAN 4 – “On Stranger Tides” jettisons most of the original cast and adds Penelope Cruz. I’ve got to be honest, POTC 3 was a brutal and unentertaining slog. If they can return to the fun and whimsy of the first movie this will be fun. If not? Time to scuttle the whole franchise. THE HANGOVER 2 – The first Hangover was a surprise hit, proving that, even in today’s PC America, everyone likes to see boys behaving badly. It was true for Bachelor Party and, to a lesser degree, in Very Bad Things and its still true today. Expectations are high for this one. If they don’t stray too far from the forumula that brung ’em this one should be a license for the audience to laugh and the studio to print money. X-MEN: FIRST CLASS – I can honestly say that this is the first of the recent superhero movies I haven’t been excited about. I’ll go see it. I feel obligated. Still, so much of X2’s goodwill was drained by X3: The One with Frasier, I just don’t think going “back to the beginning” is the way to salvage the franchise. We’ll see. It does feature January Jones as Emma Frost which is something. GREEN LANTERN – Ryan Reynolds is the ring slinging space cop in the movie DC/Warner Brothers is hoping to build a franchise around. Opinions vary on Reynolds, but I like the guy. He plays flawed smug very well. It will serve him here. The original trailer left me flat, but the newer one released at Wonder-Con renewed my enthusiasm. Well, that and living with a pair of 7-year-old boys who are stoked about seeing it. BAD TEACHER – Much like The Hangover, this one has the potential to be the sleeper of the summer. Cameron Diaz proved she could do dark comedy in Very Bad Things (two references now?) and Being John Malkovich. Throw in Jason Segel and Justin Timberlake (awkward!) and you’ve got the makings for an over the top laughfest. HARRY POTTER AND THE DEATHLY HALLOWS (PART 2) – This is the movie that Warner Brothers wishes would never come out. Its the end of the line for the Potter franchise. If the first half of this one is any indication, the series should go out with a bang. We’ve watched these characters (and actors) grow up. Now its time to send them off in style. CAPTAIN AMERICA: THE FIRST AVENGER – Chris Evans’ Human Torch was the only redeeming thing about the Fantastic Four movies. Now he takes on another Marvel icon in Captain America. Early trailers are intriguing. With this movie, Marvel lays down the final piece of the Avengers puzzle. Here’s hoping they pull it off. COWBOYS & ALIENS – Favreau, Ford and Craig. James Bond and Indiana Jones take on aliens in the old West? I wish I’d been in that pitch meeting. Then again, with the success of the two Iron Man movies, I’m pretty sure Favreau could have pitched just about anything and gotten a blank check. This one intrigues me. Genre mashups are hard to do right, but everyone once in a while someone gets it right. Favreau could be that guy. RISE OF THE PLANET OF THE APES – I’m a sucker for PoTA movies. Just ask my wife, who I forced to sit through Tim Burton’s “reimagining.” Still this one, which looks to restart the PoTA series from ground zero has my hopes up. James Franco is your lead, but really, at the end of the day its about the monkeys. Andy “Gollum” Serkis was motion captured for Caesar. Also promising. Too bad Ricardo Montalban didn’t live long enough to see this one. Still, I bet we could convince Antonio Banderas to play Armando as an homage. Honorable Mentions: Conan and Moneyball. Something about ‘Captain America’ has ‘sleeper breakout’ written on it for me. I think it’s something to do with both Evans and a WWII setting. I think it has the most potential upside v. expectations in any case.